The Desi Lit Book Group meets to discuss The Mountain of Light by Indu Sundaresan. 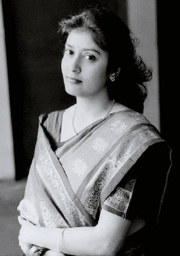 Indu Sundaresan was born and brought up in India, on Air Force bases around the country. Her father, a fighter pilot with the Indian Air Force, was also an avid storyteller—as was his father, Indu’s grandfather. She grew up on their stories on various themes—Hindu mythology and fictional tales of an elephant and a horse living in the wilderness. She came to the U.S. for graduate school at the University of Delaware, but the storytelling gene beckoned and she began writing soon after graduate school. The Twentieth Wife was her first published novel, but the third one she wrote—the first two still languish on the hard drive of some forgotten old computer and are never to be revived; they were practice runs and taught her how to write a novel. She is the author of five books so far. Indu Sundaresan's book Hotel Angeline: A Novel in 36 Voices was available from LibraryThing Early Reviewers. Indu Sundaresan is currently considered a "single author." If one or more works are by a distinct, homonymous authors, go ahead and split the author. Indu Sundaresan is composed of 1 name.